The A&P Professor: Got High Blood Pressure Covered? The 2017 Hypertension Guidelines. With the new guidelines for high blood pressure popping up all over the news recently, we may wonder what we need to know when this comes up in our A&P classrooms. And we know it will—students love, love, love to connect what they are learning in A&P with what they are experiencing in their lives. It turns out that although the new 2017 Guideline For the Prevention, Detection, Evaluation, and Management of High Blood Pressure in Adults is focused on how physicians should make diagnoses and manage patient care, the definitions of exactly what constitutes high blood pressure (hypertension or HTN) are important learning points in the undergrad A&P course. I'll outline the main things for us A&P professors to know here, but do check out the resources I've linked below to deepen your understanding of current thinking regarding approaches to blood pressure (BP) health. Regardless of the precise cutoffs listed above, in an interview discussing the new guidelines, the main author states that, "120/80 is normal, the same as we had before" the new guidelines. So I think we're safe in using 120/80 as an example of BP when discussing the normal science, even though technically it could be designated as "elevated." Not that we can't use an elevated variable measurement as an example when discussing the physiology of anything. The fact that even the main author of the guidelines uses 120/80 as the starting point of discussion makes me feel more confident in using it as the starting point of my course discussions, too. The main thing to note in the categories above is that the cutoffs for HTN categories have been lowered. This puts many more people in an HTN category that were not there before. The main goal is for those folks to have conversations with their physicians to evaluate their risk for complications and develop a personalized prevention and care plan. Note also that the category of prehypertension has been eliminated. The new guidelines also recommend prescribing medication for Stage 1 HTN if the patient already had a cardiovascular event—or is at a high risk for such an event. They also recognize that many patients will need more than one medication to manage BP and that combining meds into one pill is likely to help folks take them consistently. There are a lot of other recommendations, so reviewing the Executive Summary or similar resource (see below) may be a good idea. If you discuss hypertension, or use case studies in teaching, you need to update the cutoff BPs you are using. A BP of 120/80 is still considered the starting point for discussing blood pressure. Consider discussing the impact of the changes in the new guidelines for ordinary people. Discuss why such diagnosis, prevention, and treatment recommendations often change over time. Consider discussion other recent clinical updates. Consider discussing specific changes suggested in the new guidelines. Consider having students explore the Executive Summary and/or other documents and write their own summary or interpretation of key points. Perhaps they can create their own chart or concept map. Need some free teaching materials? 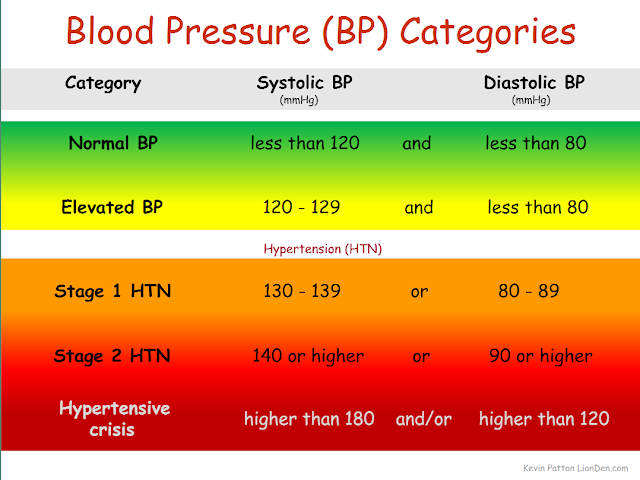 Small slide deck that includes an animated version of the BP Category chart pictured above. Part of the Lion Den Slide Collection (requires free registration to download). You can also download a static PNG image file of the chart in the slide collection set. America Heart Association. 13 Nov 2017. Free video (viewable in the player above) features a chat with the main author of the new guidelines and summarizes the main points. Very practical and easy to understand. Free set of almost 100 PowerPoint slides to use in teaching. And it has a decided focus on clinical applications, rather than the basic science. These are way, way beyond the coverage desirable in an undergrad A&P course. But some slides may be useful to you. Plain-English article summarizing the first major update since 2003 aims to spur heart-healthy lifestyle changes. Has a useful graph and links to other articles and resources. Allan S. Brett, MD reviewing Whelton PK et al. J Am Coll Cardiol 2017 Nov 13. NEJM Journal Watch Nov 2017. Brief review of the larger report (listed below), summarize key take-away points. Free PDF of the Executive Summary of the larger report. I recommend reading this first, then decide if you need to read the whole report. Free PDF of the entire report. It's huge, so make a whole pot of tea before starting it. Free abstract briefly outlines the impact of the new HTN guidelines.